Oh, to have the budget to buy every Bowen Statue and Bust I like, and the room to display them! With most lines I collect, I tend to have some sort of parameters to keep things in some semblance of control. With Bowen's Marvel products, I try to focus on Mini-Busts of Avengers, Defenders and X-Men, which casts a pretty broad net, but does keep me away from quite a number of great looking pieces that would be otherwise hard to resist. As well as collecting current releases, I love keeping an eye out for reasonable deals on past pieces, and I've managed to snag three recently: Polaris, Jack of Hearts and She-Hulk. 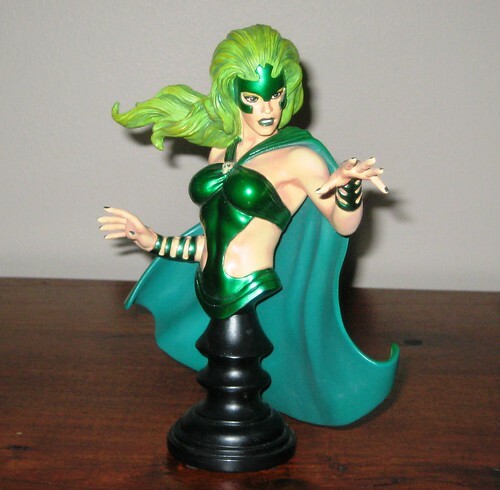 Polaris' iconic green costume is one of my favourites, and it's captured beautifully in this bust. I love the dynamic pose that has been sculpted for the Maid of Magnetism. Lovely paint work here is highlighted by a nice metallic sheen on her bodice and headpiece which adds depth and texture. A Marvel Masterpiece indeed! 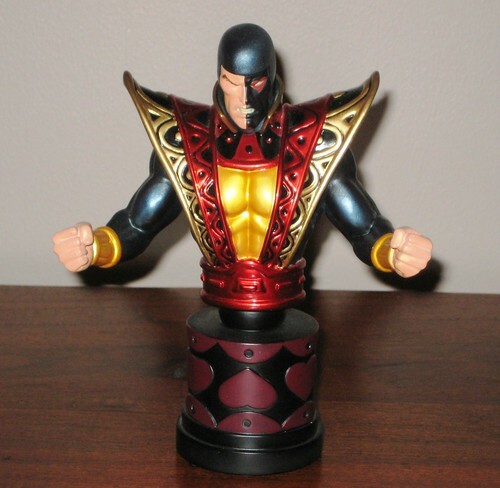 Last seen as a corpse being used to Disassemble the Avengers, Jack of Hearts is looking in much better shape in Mini-Bust form. I can only imagine what a bear it must have been for the sculptor to create all the detail on his costume, but it's been done brilliantly. Once again, a combination of metallic and flat paints adds to the depth. The blue used on his sleeves and skullcap is a tad dark for my liking, but doesn't stop this bust from cutting an imposing figure. 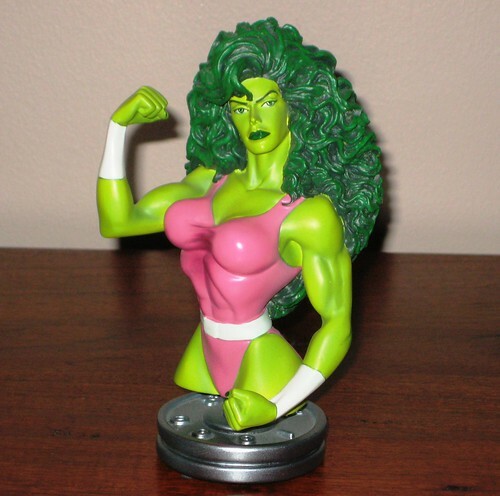 Finally, an Avenger with a much more distinguished career: She-Hulk. She's captured here in my favourite version - with Byrne-style hair and her well-known purple and white bikini. I like the pose and most of the sculpt, but her waist is perhaps a tad too improbably thin - but don't tell her I said so! The base is also a tad rudimentary compared to Bowen's efforts in it's more modern pieces. Very nice paint work makes for a great piece overall. So AFB's Bowen shelves are a tad more full, and yet adding these characters just makes to holes for their missing teammates more obvious! I dare say you should stay tuned for some more additions! You can see more pics at Facebook, discuss this at the AFB Forum, and comment on this post to enter the March AFB Comment of the Month Contest! ** Remember - this month there is an extra prize for an AFB Facebook Fan, so if you're not a Facebook Fan of AFB, become one now! Bowen Designs always puts high standards in statues issues... its sculptors & painters r filigree artisans... all these pieces r simply a prodigality of good taste & i’m in agreement with u, is a wise deal to go for the NOT so recent ones ’cause unless u would b a zillionaire, this kind of stuff is very expensive to afford it... all of them r fantastic collection figures doubtless, congrats !!! Those're some nice busts. I hope you've got the space to display them proudly. Beautiful pieces. I am not a statue person myself but those look great. Very n ice indeed. That Jack of Hearts is just perfect! very very nice indeed.. all of them. Beautifully sculpted and painted! Glorious! Though She-hulk is a bit too comic proportioned for my tastes.